If you’re a glass-half-empty person, 2016 was a disappointing year due to the loss of the Regional Transit ballot measure. The request for a major investment in reliable regional rapid transit fell short of the majority it needed to pass. As advocates, we at TRU try to see the glass-half-full and see 2016 as a very productive year. Not only did the region demonstrate more civic and voter support for regional transit than ever before, but DDOT bus service significantly improved, M-1 Rail’s QLINE is nearly ready to start, and the new regional Reflex service is providing seamless cross-county connections. 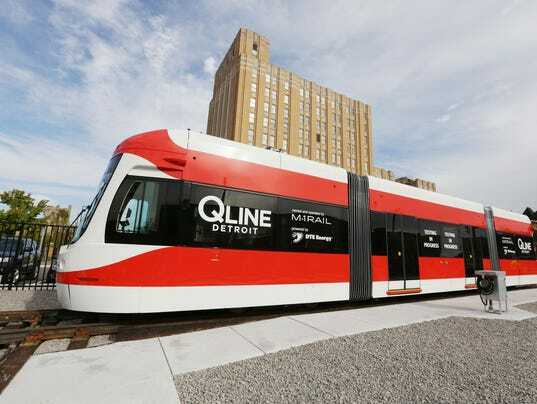 While work remains, 2016 meant notable progress for Detroit area transit. Please enjoy this summary of 2016 Detroit transit and TRU’s Year-in-Review. A few years ago, DDOT bus service was so bad that a third of scheduled buses didn’t operate, leaving riders waiting hours out in the cold. Mayor Duggan, Director Dan Dirks, and the staff have worked very hard to turn DDOT around. They’ve hired and trained new drivers, bought new buses, and made major facility and other improvements. Now scheduled bus routes not operating is the exception, not the norm. In dialogue with riders, drivers and advocates like TRU, DDOT has restored 24-hour service on 9 routes (which TRU’s Ruth Johnson and Mayor Duggan spotlighted in the below TV report) and launched new express routes, among other improvements. More work is needed in on-time performance, bus frequency, customer service and other areas. Yet the turn-around from crisis to a solid bus provider is greatly appreciated. As the Regional Transit Authority evaluated the gaps and flaws in our region’s transit service, the lack of consistent seamless transit between Detroit and the suburbs stood out. So RTA worked together with DDOT and SMART to launch a new service called Reflex. On Woodward and Gratiot, Reflex now operates twenty hours a day and on the weekends providing quick limited-stop service between Detroit and northern suburbs. While not very frequent nor well-promoted, this new service provides an important connection, saving riders time and transfer hassle. It also demonstrated the ability to different transit providers to work together to improve transit rider experience. Michael Ford introduced the Regional Transit Master Plan to a packed crowd. This region has many different transit challenges and needs; balancing them against limited revenue is always difficult. The RTA did an impressive job of developing a Regional Transit Plan that addressed the divergent needs of current transit riders, potential new riders, employers, politicians, and others throughout the region. TRU is pleased to have provided our “Essential Components of Great Regional Transit” recommendations, along with detailed feedback and suggestions on the draft plan, many of which were incorporated into the final plan. We also worked hard to make stakeholders throughout the region aware of the plan and to engage them in the providing feedback in the planning process. While no plan will please everyone, we helped RTA craft a solid plan that if implemented will significantly benefit people throughout the region. We quickly arranged a press conference (below) with transit allies that got enormous press attention to the need for regional transit. We developed an online action alert to the County Execs and RTA board members and highlighted the issue through email, social media, and allies. And we won. The RTA had to change their voting structure to give veto power over plan and funding changes to each county, but the full Board unanimously approved placing RTA funding on the November ballot. For the past 17 years, TRU has been working to build support for the need to invest in more and better transit among both regional leaders and the general public. That level of support reached a new high this year with more than 250 of the region’s business, civic, and faith leaders stepping up to endorse the Regional Transit ballot measure. TRU helped launch these efforts working with partners at the Ecology Center, Metro Matters, Michigan Environmental Council, MOSES, and Harriet Tubman Center in recruiting over 100 groups on to transit support coalitions. TRU worked hard to make sure these were diverse coalitions, recruiting groups ranging from Henry Ford Health System and Goodwill Industries to Preservation Detroit and the ARC Detroit. TRU worked with these and other groups to expand our outreach and public engagement work, highlighting the importance of regional transit investment to audiences throughout the region. We directly made more than 35 presentations to community groups, did outreach at more than twenty other events, and published articles in more than a dozen publications. Our emails and social media reached tens of thousands of people with easy-to-share information about the regional transit plan and ballot measure. We provided a toolkit of materials that helped other groups educate their members and supporters about the importance of transit. This year also featured unprecedented levels of media coverage of transit. As part of TRU’s ongoing media engagement, TRU leaders were interviewed or quoted more than 50 times this year. In addition, TRU worked directly with the Vote Yes for Regional Transit campaign, run by Citizens for Connecting Our Communities, on their outreach materials and media outreach. The campaign garnered over 440 media articles in nearly every major media outlet, including dozens of powerful op-eds and ballot endorsements from Detroit News, Free Press, Crain’s Detroit Business and Michigan Chronicle. TRU’s Megan Owens and the Ecology Center’s Vince Rocelli urged a Vote Yes for Regional Transit at the big Arts, Beats, & Eats festival. TRU worked tirelessly with dozens of other transit supporters to spotlight the importance of supporting the regional transit ballot measure. While the campaign was not as community-coordinated nor as field-focused as we recommended, we did everything we could to build public support. In the end, over 894,000 people voted to fund regional transit improvements, but 911,000 people voted no. Since majority support was required to implement the funding, the regional transit plan will not be implemented at this time. This is a significant setback, but is far from the end. 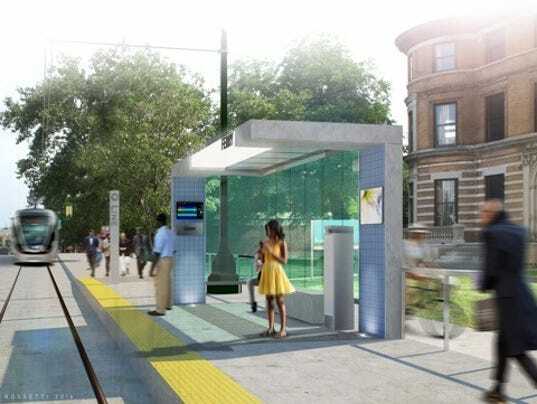 Rendering of a station being built for M-1 Rail’s QLINE on Woodward Avenue. After an absence of more than sixty years, streetcar service will return to Woodward in 2017. M-1 Rail had a busy 2016 completing construction of the 3.3 mile rail line, in coordination with MDOT’s complete reconstruction of Woodward Avenue. The first streetcar vehicles have been built, delivered, and tested on the rails. Over the next few months, they’ll be finishing construction of the stations and overhead lines and running literally 1,000 tests to prove the streetcar’s safety and reliability before they begin passenger operations in the spring. TRU is pleased to serve on the M-1 Community Advisory Council and looks forward to helping educate future riders and others about this exciting new service. This has been an extraordinary year for Detroit regional transit in large part because of the many groups and individuals who got involved in supporting it. Far too many to list, TRU deeply and sincerely thanks each and every one who supported our work and helped to spread the transit message. By continuing to work together, we can build on this year’s great momentum and continue the vital progress of this year. Together we’ll make 2017 the best year for transit yet! Thanks!